NBA training camps have begun; the season is rapidly approaching. Can you dig it? I knew that you could. And so we continue our previews: 30 of them in 30 days. Up next is a team that you will be sick of hearing about by the end of the season (assuming you aren't already): The Los Angeles Lakers. When last we saw them: Finished 57-25, first in the Pacific Division and numero uno overall in the West. Made it all the way to the NBA Finals, where they were eliminated by the Boston Celtics in the league's first ever "six game sweep" (oh no, that's not going to motivate them at all...).They're heeeeeeeere: Dwayne Mitchell, Josh Powell, Sun Yue They're NOT heeeeeeeere: Ira Newble, Ronny Turiaf The Good: There was very little turnover from a team that went to the NBA Finals. Kobe should still be in MVP form. Andrew Bynum is back to add muscle, rebounding, shot-blocking and those nifty little jump hooks. Thanks to Bynum's return, Grand Theft Gasol should get to spend significant time at PF instead of C, which better suits his marshmallowy goodness skill set. Derek Fisher oozes veteran leadership and, of course, hustle: Fish lead the league in drawing offensive fouls last season (54). Lamar Odom can do a little bit of everything and now gets to operate under the Kobe/Gasol/Bynum three-way safety umbrella (which is good, since Lamar tends to wilt under the bright lights). They're motivated after last season's Finals Fail. (Said coach Phil Jackson: "There's still a little angst and anger there.") They're pretty deep, with Sasha Vujacic, Jordan Farmar, Trevor Ariza, Luke Walton and Chris Mihm all coming off the bench. They're guided by a Hall-of-Fame coach and a proven offensive system: Last season they were third in field goal percentage (.476) and fourth in points scored (108.6). 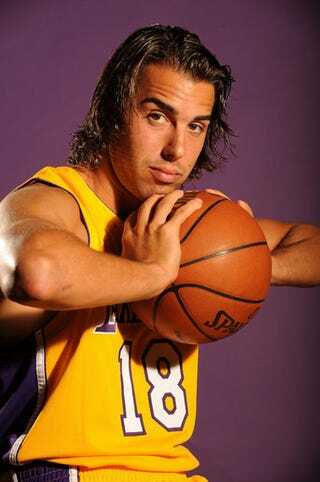 Sasha Vujacic is still The Machine. Let's face it, the Lakers can transmute lead into pure gold and transform evil into beautiful woodland fairies. The Bad: Kobe might be a little worn down: He opted to forego pinky surgery, he's logged more minutes over the past three seasons (9,609) than any other player in the NBA (according to the Elias Sports Bureau), and he spent the summer playing for Team USA instead of getting a little R&R. Lamar Odom is (as always) a little off his rocker: Jackson said he might want to bring Odom off the bench, and Odom responded by saying, "He must have woke up and bumped his head. He probably hit his head on something - boom. To start off like that, you've got to be out of your...mind." Lovely, huh? Because I'm sure Odom knows more about basketball then Jackson. Speaking of player discontent, Andrew Bynum apparently "oozed petulance" when asked if he liked coming off the bench. His response, highlighted by an eye-roll, was "Not at all." (Hey, it wouldn't be Hollywood without a little drama, right?) There's also no telling how Bynum's re-introduction to the lineup will affect team chemistry, or even how well he'll play...assuming his knee and post-rehab psyche are both 100 percent. The Lakers were merely an adequate defensive team last season. Oh, and they look horrific in short-shorts. Fun Facts: Believe it or not, the Lakers franchise was founded in 1946 as the Detroit Gems of the National Basketball League. The Gems were owned by a man named King Boring. No, really. After one season - during which they went 4-40 - the Gems were bought by Ben Berger and Morris Chalfen, who moved the team to Minneapolis and renamed them the Lakers. Even though 14 former Lakers are in the Hall of Fame, only seven jersey numbers have been retired. Magic Johnson had 138 career triple-doubles. For some perspective on that accomplishment, Kobe Bryant has had 14. Videotastic extra: Here are some amusing moments from Game 3 of the 2008 NBA Finals. My favorite was when Posey blocked Sasha's freethrow.